The olive green coloured Orthodox text, is surrounded by three dimensional vines (made in the Paper-Sculpture technique) which intertwine with the letter " V". The play of light emphasizes the cast shadows. Light coloured butterflies are resting on the vines. Small 23K Gold Leaf dots and a Gold Leaf Star of David add beauty to the complete artwork. 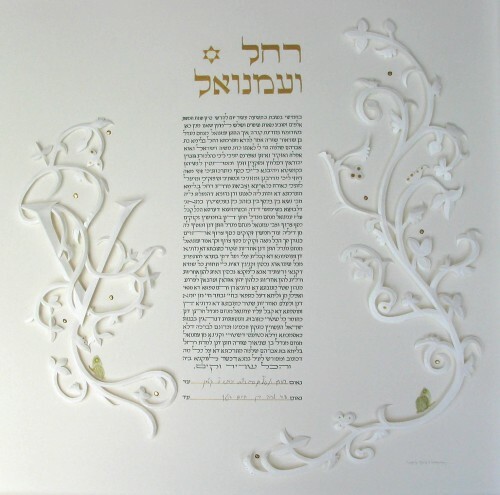 The names of the Bride and Groom are in Hebrew letters above the ketubah text.